Peer-reviewed journal supplements provide you with a credible, objective means to publish themed articles on topics related to your company’s business. Supplements are mailed with the regular issues of the journal to the entire readership and are also hosted online on the journal website. A Continuing Education component may be included to enhance value. All articles within a supplement must undergo independent peer review. A Special Section is a sponsored section of a regular issue a similar to a supplement but with fewer articles focusing on a specific topic. Articles go through the regular peer-review process. The sponsor gets recognition on the cover (depending on the journal) and/or the table of contents. 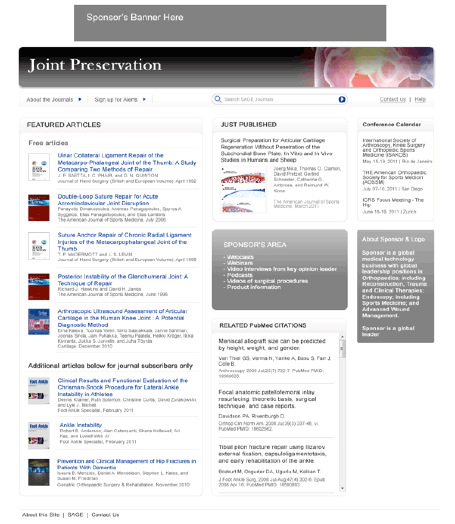 The articles are included in the online issue and any number of pages and articles can be included online. The print issue can be purchased in bulk; pricing depends on the journal and the order quantity. Reprints of the special section articles can be purchased, and all the articles can be combined into one reprint. Sponsoring locally translated content is an effective way to raise brand awareness of your product whilst also A aligning your company with respected, valuable and A high-impact journal content. SAGE has published a range of sponsored local editions for our journals in languages ranging from Portuguese, Chinese, Japanese and Turkish. We have a network of contacts including trusted third party vendors with whom we work on translated articles, supplements and local editions and welcome the opportunity to discuss your requirements further. Target your audience and identify yourself as an educational partner in your field by sponsoring a full-year print subscription of a SAGE-owned or Society-published journal. Your sponsorship will be recognized with a company-specific communication poly-bagged with the first issue as well as recognition on each cover issue throughout the year. SAGE will print and mail to your sponsored subscription list for one year and recipients will receive their “free” subscription on your behalf. As an industry partner, you have the opportunity to provide open access to leading peer-reviewed content from SAGE journals. A Sponsored Collection allows you to highlight specific articles and research pertinent to your business and product lines. You will receive sponsor recognition on the journal home page with links to the Collections web page, where your company will be recognized through a leaderboard or skyscraper banner advert. A journal may have multiple Sponsored Collections. Sponsored Collections are available for all SAGE journals. Pricing varies by journal size, length of sponsorship and number of articles included in the Collection. Brand your company as the leader in the field by partnering with SAGE in the development of a destination website that focuses on a specific topic pertinent to your business and product line. Relevant journal content from all SAGE journals and links to sponsor-specific information such as webinars, product information, and corporate sites can be included on the microsite. This is an excellent opportunity to drive traffic to your own corporate or product sites while branding your company as the leader in a specific topic. Educate your target audience by partnering with SAGE for your next webinar, podcast or vodcast and take advantage of an extremely cost-effective way of engaging with our online readers and subscribers. Showcase your company, products, or services and drive traffic to your corporate site.